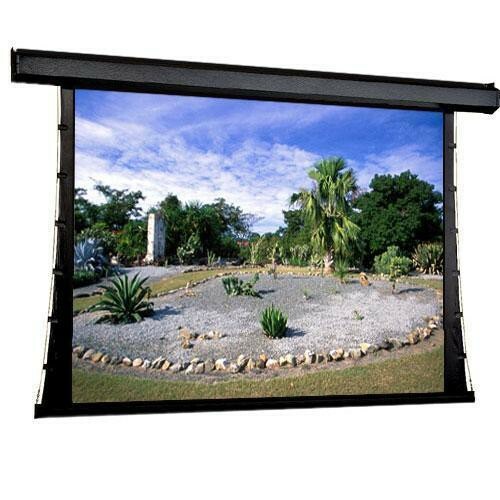 The Draper 35.25 x 56.5" Premier Motorized Front Projection Screen with its automatic Tab Tensioning System and flat screen performance, exhibits picture quality far superior to older screens previous generations used. This elegant screen will grace any lecture hall, school room, learning center or hospital theater. The screen is quiet when in "up/down" operation because of its vibration insulation system, which minimizes noise. With the flick of a switch, the screen is ready to use by means of the built-in standard motor with preset, accessible limit switches. The steel case and special tensioning dowel are finished in flat black. The Premier's motor is mounted inside the roller on special vibration insulators, so operation is smooth and silent. You have your choice of M1300, M2500, HiDef Grey or Cineflex rear projection viewing surface. Note: This screen is also available with a Plug & Play option. This screen is also available with a Plug & Play option. Box Dimensions (LxWxH) 82.0 x 10.0 x 10.0"